The colour postcard view above of the corner of Wilmslow Rd and Norman Rd is not uncommon. 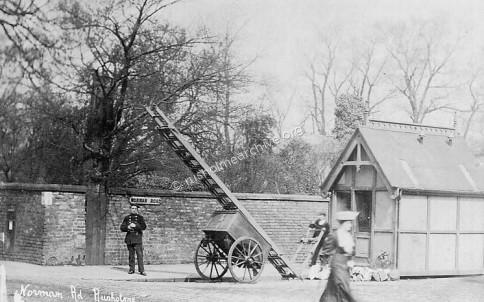 The image must date to the first year or two after 1900 because a note buried with a similar card in the Manchester Library 'Images' collection refers to the shed and ladders as the Norman Rd Sub-fire station, (manned 24hrs) that closed in June 1912. William Royle refers to a Rusholme Volunteer Fire Brigade headed by a Captain called William James, the dating of this might be in the 1870-80 period. 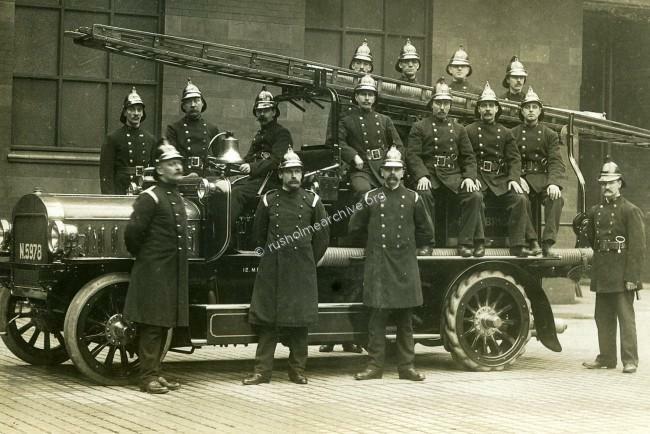 In the 1888 Annual Report of the Manchester Fire Brigade, the Superintendent, Mr Tozer, said the the Rusholme Volunteers, consisting of a Captain & five men, had rendered invaluable assistance. The postcard views below in black & white are of better quality and the first one is more animated. I contacted the Greater Manchester Fire Brigade Museum at Rochdale, and one of the volunteers, Bob Bonner, ( a retired fireman), told me what he knew about how much a small substation like this could do. 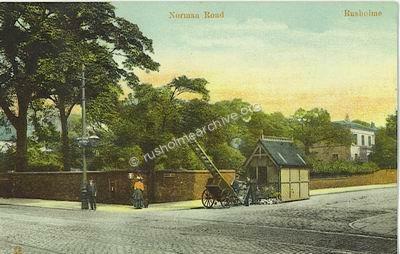 'Thank you for the splendid photo of the “street fire escape station” at Norman Road, Rusholme. These were erected in the mid-19th century around the city to improve lifesaving possibilities until the arrival of fire engines from the nearest proper fire station. The “escape” ladder was usually manned by one man, (nights only at first I believe) who would be sent out for the tour from his normal station. I think 1912 is about right for its closure date, without checking up. The main reasons for the street stations being closed was the introduction of the street fire alarm system in 1911, which brought about quicker receipt of calls, also the introduction of horse-drawn escapes (hand-run prior to that !) and, ultimately, the introduction after 1911 of motor fire engines. I also note the old-pattern Manchester wooden fire hydrant sign on the corner, very unusual in being “bent” around the corner. As it was made of wood, I presume it was sawn in two first and then erected on the corner to be more accurate in its directional information. 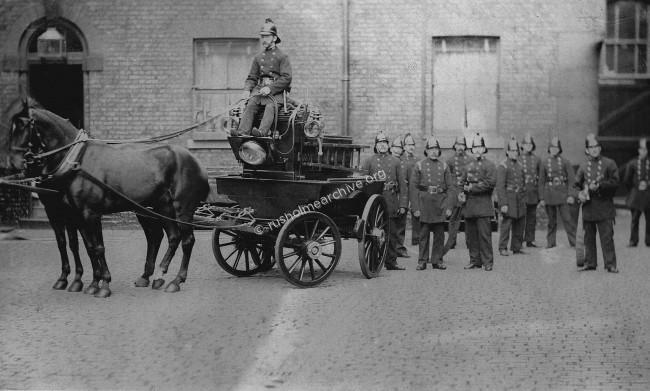 The photograph of a horse-drawn fire-engine below is certainly dated before 1906 according to Bob Bonner of the Greater Manchester Fire Service Museum. The photograph has been taken in the yard of the Jackson Row fire station, this closed in 1906 when the London Road Fire Station headquarters opened. This engine is perhaps the most likely that might have been sent to a fire in Rusholme - I wonder how long it would have taken from the city centre? The postcard below was sent by Alfred Smirthwaite to his sister Lizzie who lived in Yorkshire. 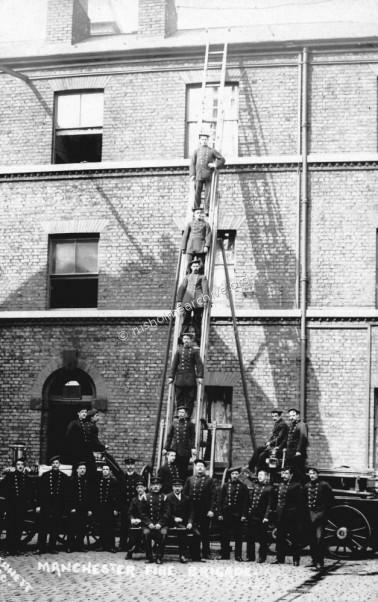 Dated 1906 you can see how high the escape ladder could be elevated - certainly high enough for the biggest houses in Rusholme, this photograph also appears to be taken in the yard of the Jackson Row fire station. 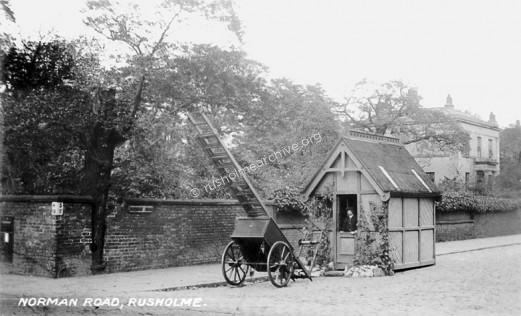 The photographs below have been very kindly provided by the Greater Manchester Fire Service Museum and again Bob Bonner provided the following notes of the fire engines that might have come to any fires in Rusholme. The use of large old houses for use as Nursing Homes in Rusholme & Victoria Park was not unusual, remember there was no National Health Service as we have today. The large houses were also popular for use as schools, further along No.5 Norman Road was used as,'Young Gentleman's Day School', they were under the care of Henry Jones B.A. No evidence at present as to date of demolition of Norman House. Norman Road nursery. There is a plot of land marked on the map showing allotment gardens fronting Norman Road and to the west of the footpath, (known as Dead Mans Alley), that connects Dickenson Road to Norman Road. Perhaps this advert from a Rusholme Repertory Theatre programme dated 1934 is referring to a nursery on this site? Further east on Norman Road a fine pair of villas were built circa 1850, Nos 9 and 11 Norman Road. These are still in private occupation and during the 1880s No.11 was the home of Professor Sir William Boyd-Dawkins. Born in Welshpool he was the son of the Rev. Richard Dawkins. 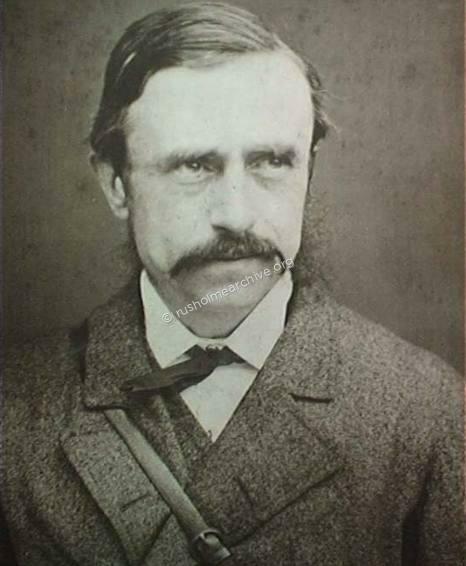 Educated at Rossall School in Lancashire he then went to Jesus College Cambridge where he studied both classics and natural science, graduating in 1860 and becoming a geologist. He was appointed curator of the natural history collections at the Manchester Museum in 1869 and became the first Professor of Geology at Owens College (then in Quay Street later becoming the Victoria University of Manchester in Oxford Road from 1872 until his retirement in 1909 aged 72 and was knighted in 1919. He became Britain’s first Engineering Geologist and was involved in the coal industry, water-supply projects and the abortive Channel Tunnel project of 1880. He produced the geological report of the feasibility of the Manchester Ship Canal. Should there be a blue plaque affixed to No. 11 Norman Rd? Next page, Ice skating in Rusholme.